As expected, stage 5 ended in a bunch sprint, which was won by Mark Cavendish. Marcel Kittel was caught up in a crash around 15km from the finish, ending his hopes of going for the stage victory, while Julien Simon did not contest the sprint. The Omega Pharma Quick-Step lead-out train looked to be on top form today, delivering Cavendish to precisely where he needed to be. He blew Greipel away and the only man that looked to be able to match his pace was Sagan, but his starting position was too far behind Cavendish to hope to catch him. Stage 6 will be another bunch sprint. There is one small category four climb, but it will not have any impact on the stage and the sprint teams will control the race and bring the breakaway back so the fast men can duel it out again. The finish is very straightforward with no real worries for any of the teams with barely a bend within the final 2.5km. Sadly, the odds on Mark Cavendish are nowhere near the frankly ridiculous 5/1 that was offered today. As mentioned, his team delivered him perfectly, with Tony Martin and Sylvain Chavenel setting a blistering pace and Matteo Trentin and Gert Steegmans leading him out flawlessly. If they can control things again tomorrow, he will be very tough to stop. Peter Sagan was the only man that looked to have the pace to trouble him today. However, as we have seen plenty of times this year, his team are struggling to get him into the perfect position and he is having to come from deep and try and catch those ahead of him. Against the likes of Cavendish, that is virtually impossible. However, if they can deliver him to the right spot, it should be a titanic tussle between the two green jersey contenders. Marcel Kittel will be desperate to get involved after being involved in the crash on Stage 5. Argos-Shimano set him up well for the sprint on the first stage, albeit a fairly straightforward win after most of his rivals were caught in a crash, but it showed that they are well-drilled. I fancied him today and he will be even more keen to win tomorrow. Andre Greipel will be up there as well, although his lack of speed at the death today was slightly concerning. Cavendish, Boasson Hagen and Sagan seemed to breeze past him and he will have to find some extra speed from somewhere if he is to compete tomorrow. In terms of the other sprinters, it was another good result for Edvald Boasson Hagen, who managed to get into Cavendish’s slipstream and go with the Manxman to take second place. He will certainly attempt the same tomorrow and has every chance of going well again. Alexander Kristoff has been involved in most of the bunch sprints so far, making a nuisance of himself. He managed to finished sixth today to add to his second in the first stage and he will no doubt be involved again in a battle for the top places tomorrow. Matt Goss was held-up in the crash today, meaning that Daryl Impey and Simon Gerrans were Orica GreenEdge’s main hopes, but the Australian team will be hoping that Goss can get involved tomorrow. However, he has struggled somewhat so far and it would be no surprise should they work for the South African, Impey, rather than Goss tomorrow. 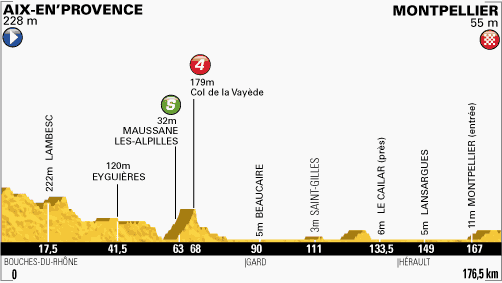 As with today’s stage, the likes of Danny van Poppel, Roberto Ferrari and Nacer Bouhanni will all be mixing it with the big boys, but whether they have the team or the pace to win the stage is doubtful. If things split up due to the strong winds that are expected, it might be worth looking at the odd outsider, such as Davide Cimolai, who had a good result in Stage 2, and Ramunas Navardauskas, who enjoyed a successful Giro. They will not be able to outsprint the pure sprinters, but have the pace to win in a reduced group. While I suspect Mark Cavendish will be very tough to beat, I cannot back him at odds-on. We have already seen how crashes can derail anyone, so it will be a couple of the other favourites that we shall concentrate on. keep up the fantastic tips!